Get the bunny. If the bunny is not used to being handled, then you should spend some time familiarizing him or her with being petted and handled. You should be doing this over a period of weeks, and by the time it comes to clip the nails, you should at least be on nose butting terms, if not, you haven't been spending enough time with your bunny, and may be a bad bunny owner. Spending time with your bunny should not only be enjoyable time for you, but it makes necessary tasks like nail/claw clipping much easier and safer. Even if the bunny is used to handling, the bunny may not be overly pleased about having his or her nails clipped. The bunny views him or herself as an autonomous creature who doesn't need you for anything. They are the Masters and Mistresses of their domain. They will not willingly submit to your clumsy manhandling, any more than a pretty princess would go willingly to live under a bridge with a troll. This means that you are going to have to get a firm grip on the bunny. I find it is easiest to place the rabbit on your lap whilst you sit cross legged, and use the forearm to keep the bunny pressed snugly to your body whilst the hand of the same arm takes hold of the foot gently but firmly and isolate the claw to be trimmed. This position allows the bunny to be pinned and lifted a little, rendering struggles useless in a safe fashion that won't get the bunny hurt. At all costs, make sure the bunny is safe and don't pin it by its neck or head. Bunnies are well known for being unable to asses the consequences of their struggles before they ensue, and you want a bunny with nicely clipped nails, not a dead bunny. Carefully clip the tip of the nail, do NOT go too far along the length of the nail, even if it has grown a little long. Unless the nerve is very clearly visible, which is often not the case with rabbits who have darker claws, you must be careful. Trim back slowly, taking a little at a time. You may have to repeat this process over several days. If you do go too deep you will hurt the bunny, the bunny will bleed, and probably kick or bite the living hell out of you. This will be your fault, as you were told to be careful, weren't you. Let the rabbit go gently, and be prepared to dissuade it from biting you in revenge. Give a treat instead to help ease the mortification that the rabbit no doubt feels. You may be in his or her bad books for a while, the subject of haughty looks and disdainful foot flicking. Don't let it get to you, being a bunny owner isn't just about the good times, sometimes you have to be firm too. I have a Flemish giant who is the sweetest bunny alive until I try to trim his nails. My advise especially with big bunnies is use a blanket or towel and swaddle the heck out of them then hold the swaddled bunny cloše to you body and hold firmly. I still get a few bloody scratches but no where near the amount with out the blanket. I take my bunnies in the bathroom on the slippery floor so they can't dash away from me. I move towards a corner and then go down on my knees and sit on my feet and lean over the rabbit. I slowly pick up each paw and clip away. I find that if I'm calm and talk to them gently they will relax and let me clip. You can bring some treats in to keep them preoccupied. If you need to find the quick (the vein) have a small flashlight on hand and shine it underneath the claw and it should show you where you should not be cutting. Remember to keep your rabbits nails trimmed for their health and your safety. If you can't do it, please take them to a vet. For those of you who think your rabbit is mean, it is probably just scared. You need to spend more time with your rabbit and be gentle and keep him or her relaxed. Lots of patience needed! Remember, rabbits are prey animals and are always on alert - if you move too fast and are grabby with them, they will be scared and run from you. Why take a chance that your bun will bite you? If it's a little aggressive, have the vet trim its nails. My Ramona lives free-range in a room with three guinea pigs. I put a small cat bed in a large wire cage. She sleeps in there and when it is time to go to the vet, I just c lose the cage door and off we go. She is a very loving rabbit, luckily. Ive noticed my rabbits nails have curled slightly as I haven't been cutting them all the time because he's a biter! Anyone no if these get cut more often will there go back to normal? Think you'll find it looks like a tiger... Idiot. im scared to trim my bunnies nails.. can my vet do it?? how many time does I need to trim there nail?? 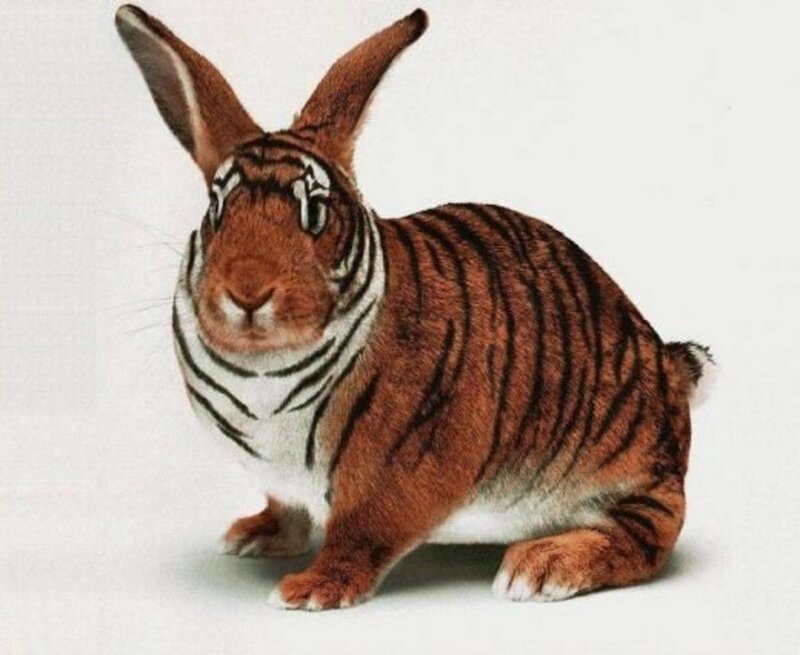 and is the bunny in your picture real lol..
it looks like a lion.. Thanks for a great article, and I love the description of the haughty looks and foot flicking cos it describes our Hoppy perfectly when he is annoyed at us for anything. Our Star bunny is a perfect angel bunny who just lay on her back in my husbands arms while I did her nails. However, Hoppy is a rescue bunny from a very cruel home, and although he is much better than he was and is learning to trust us, he is still very difficult to handle and bites when he feels threatened (ie. held). He also has black nails which makes things so much harder. Anyway, our vet is lovely and trims his nails for us every 6 months when he has his injections, and if we need to do them in between times the vet nurses will do them free of charge. If you have a traumatised bunny it is worth asking your vet for help as they are not all about money and some will help out in cases like this. Anyway thanks u have helped me heaps! I have some rabbits who obviously didn't have their nails trimmed regularly before by previous owners so this is what I did the other day. I would take one rabbit and put it in a pillow case. Then I carefully pull one foot out at a time and trim those nails. I know it sounds mean but with a large strong rabbit, there's really no other way to get it done. I've tried wrapping them in a towel before but a really strong rabbit can get out of that no problem. Hope this idea helps someone out. my bunny freaks out and kicks me. the scratches hurt like hell. my bunny is 3 months old can i start trimming its nails? My rabbit is the kind that if you let him out of his cage he will run as fast as he can and I almost lost him finding that out. He does nose bunts and loves to be petted but nails just don't work! I heard that to find the quick you use a flashlight but I still can't find it! I was succesful of cutting one nail before he was mad about it. He just doesn't trust me, i'm lucky to hold him for 17 seconds without any troubles. I am really getting worried for the previous owners seemed to not have known about the nails, and they are starting to curl. I want to get him to the vet but like I said he is terrible being held and my parents are busy. I have tried everything and am starting to give up hope HELP! my bunny is great w/ getting his nails done!it's my cat that is the problem. whenever i get the clippers out and start clipping,she bites and scraches the living crap out of me. what should i do? All the talk about clipping and how offten but no one said how young can you start clipping a kit. Thanks for the help!!! Is that a real bunny! Oh you are funny funny funny! You are hilarious! A GREAT article, not only informative but entertaining as well! Thank you! I did my rabbits today too, they had gotten quite long. I put her on her back and hold her like a baby. If you don't hold the nail while you cut it, the cutters will pull the nail sideways as they cut which the rabbit will notice more easily, and it won't be a clean cut, so with your left hand, support the nail with thumb and finger (keeping it still), and that is more effective. Next, my rabbit has white claws, so luckily I don't have the problem of knowing where the root is. But when it comes to cutting, I found the clippers cut better if you cut off say 2-3mm at a time, cause when you try to cut too much off at once, it has the effect of crushing the nail, whereas just clipping the end bit by bit makes it go smoother, but may take a little longer. I tend to cut the rabbits front left, and back left claws in one go, then turn her back over for a couple of minutes before turing her over again to do the front right and back right. I don't advise keeping rabbit on back for too long, cause you don't know how its affecting their breathing or if they are stressed by it. Perhaps there is some way of finding the root for dark claws, I don't know, perhaps using a torch or xrays will show it up. anyway, to the nail thing. i discovered quite by accident, that rabbits love to dig. i thought to myself, "self, this digging is a weakness we must turn into a strength. what to do, what to do?" i got a piece of plywood and stuck a bunch of self-adhering sandpaper discs on it. they're close together and adhere to the wood really well. and bun seems to love scrabbling on it. the nail issue is super-easy to cope with and less trim time required. i hope this works for someone else as well as it did here. of course, i would (as an animal person with many animals and many teachings around animals of all sorts and sizes) not advocate any buns eating the sandpaper and if that were to become an issue...well then, the issue would have to be removed (the sandpaper). Thanks for the article, It is awesome! I have a BEAUTIFUL giant Rex, I love her to bits, she lives with my husband and I in our room. We have had her for only a couple of weeks, we got her from the SPCA (I have no idea how anyone could give up their pet), I have a felling she comes from a bad home so it is taking her a while to warm to us. I have been trying to get close to her, spending loads of hours on the ground talking to her and she is making some awesome improvements, she went from a growling bitter to licking the carpet and my clothes and everything around her as a sign of affection. This morning Hubby and I woke to Vera walking across our faces!!! We are both very scratched up and figured the time has come to cut this little lady's claws .... one VERY unhappy bunny later and we only got the front done!!! Thanks for the article it is very helpful, I will try again with the back tonight! how would i clip a rabbits nails if they are bllack at the bottom also will human nail clippers work? i am trying to clip my rabbits nails but when my rabbit sees the neal clippers he hides and wont come out until i put the clippers away.What do i do? I just received an aggressive male bunny that habitually bites with very long, overgrown nails, and came here looking for tips before I decided to try this: I put on my heavy gloves and herded it into the sleeve of a sweater with holes, and then was able to extract one paw at a time and trim all the paws with a pet nail grinder. That actually went a lot better than expected, and the rabbit seemed pretty calm throughout the whole procedure - he was calm enough for me to even roll down the sleeve to make sure I could see his nose twitching the entire time. Getting him out was trickier than getting him in, but once I set his back end in his cage, the sleeve came off with no problem and now he's happily chewing on a waffle treat in his nesting box. We still have a lot more trimmings to go until his nails get anywhere close to a reasonable length, but I'm a lot more optimistic now that we'll eventually get there! Pedi Paws works great for trimming your rabbits nails. So, stupid me tried cutting my 10 year old rabbit's toenail on one of his hind legs. I did, but he kicked his leg as I was doing it resulting in his toe bleeding a lot. He hides under my bed and hops away while I try to help him clean off the blood. What do I do? my chekered giant trys to bite me when i put food in his cage and this really bothers me because he has been really miles manored before this whole ordeal i need some help because this really doesn't help the show factor (he is a show rabbit)he is not very old but i figured you could help me with this show crushing problem. Thanks for the info. I will give it a try as we have had rabbits for a 3 months and I get scratched to pieces everytime I try and cut their nails! this info helped heaps. but does this also go for cutting guinea pigs toenails? My bunny lets me clip all her nails EXCEPT the "thumbs" (the nails that are further up the front leg on the inside. )She never bites when i clip her nails, but when I go to clip the inside nail, she pulls away or sticks her nose in the way so i cant reach. but my French Lop is older and can't see so well so he prefers not to go anywhere. He is a loose rabbit so he has a sense of freedom that makes nail clipping even worse but otherwise, I wish for the old days when a quick trip to the rabbit vet got the job done! My bunny is lovely and tame, a little nipper though i may say. I havn't clipped his nails yet but i am scared to when it comes to having to do the job. He has white nails so should i be able to see the veins? I am thinking of taking him to the vets or a groomer, does anyone know any costs or an estimate of how much it would cost? Also, as above, any pictures? That is the best article on bunny nail clipping I have read. At least you are honest! I have a 16 week old Lionhead and a guinea pig too. They both became friendly really quickly and are happy and healthy but I am still so scared to chop their nails. Especially guinea pig as he has enough personality for the both of them, bunny is really chilled out with everything. Here is to hoping that he still will be!! Agree with earlier post thought that a picture would really help. I've had my bunny for three years now, and she was either a few months or weeks old when we got her - the idiots at the pet store didn't know. Anyway, I just had a discovery that sent me to, probably overreacting, tears. My bunny has a cut just down from her left ear, in the soft part of her fur. She goes mad if you try and see it, but I read places, and it said to apply Neosporin, as long as it was not the plus kind with bensocane. But now she's scratching at it and biting it like crazy. We've also never had much success with her nails. We do, very often, try and trim her nails, even with the "bunny-trance" method. It doesn't work. She puts up a biting, scratching, mad fight, until we free her. Also, though she was always a tame bunny, we've always had trouble with her getting out of the cage. Her cage is kept inside, and she always has pellets, what we like to call "bunny nibbles," and timothy and alphalfa hay. Sometimes, it's a journey getting her out of her cage, and I seem to be the only one up for the job. We've "fenced" off a large space in one room for her to play without being harmed. The only problem is, when it's time to go into the cage. She seems to know when it's late, and time to go to bed. She runs like the dickens, trying to stay free. It's not like we don't let her out - she's out for many hours a day. Sometimes I'll get lucky and catch her when she's about to flee. I've read that throwing a blanket on them can be officent? Whoever wrote this is a douche. When my mom was trying to give my rabbit a grape my rabbit thought that my moms finger was the grape.He bite my moms finger and was trying to get a piece off of it.It gave my mom a blister. Jacqqui do you live in MI? What about giant breeds? What's best to use to clip those? Thanks for any help, I'm a new house bunny owner and a giant bunny owner at that. What do u do when your bunnies nailstart to bleed?? does it stop bleeding or would i need to call a vet?? a centimeter on a guinea pig's nails is way too much!!!!!! ive had guinea pigs for 5 years, and one had black nails. just trim off a little bit, like 1/5 of a cm. and do it more often. My rabbit is about a year old. When he was smaller clipping his nails wasn't a problem - he'd just sit in my lap chewing his favorite toy and i was able to clip all his nails, front and back, without a problem. Now that he's fully grown and the size of volkswagen beetle, he just doesn't want anything to do with it. He's a free range bunny and is really loving and well-behaved... until it comes time to clip his front toe nails. His front nails are in desperate need of a trim and I'm really tempted to just take him to the vet. I use people nail clippers - I've tried two different brands of rabbit nail trimmers and they've never been sharp enough to just cut the nail without pulling unnecessarily. I was considering inventing some sort of digging box that would simultaneously file his nails, but with my luck he'd sniff it twice, rub his chin on it all possessively, and then never look at it again. This is really where scientists and inventors should be expending all their time and resources- clipping bunny toenails. I'm in 4-H and have been taught a lot about bunnies over the years. People nail clippers work just fine and are almost easier. For bunnies with dark nails, I would recommend just cutting a very little bit of the nail at a time: a millimeter or so. I have a guinea pig and everytime i cut his nails just a tiny bit but they always bleed i bit but im not even taking a cm off and because his nails are almost black so i dont know where the blood stream so they always bleed how can i stop this because they are quite long for a guinea pig ?? Could you use a pedi paw on a bunny? Are dog nail clippers ok? I got my bunny when he was 6-years-old, and I don't think they ever took the time to do anything right with him! It tooke me weeks to get him to eat his vegetables, and it was impossible to hold him, and he still hates being held!When I realized that the people hadn't trimmed his nails, I had had him for only a few days, so I had to go through all the "hi atti, I'm niki... let's be friends" for a few weeks. I spent 4 months doing the "bunny burrito" and the old 1 nail at a time stuff until the groomers had a sale for half off everything when we took our dog to get groomed. They said they did bunnies! So now for $8, I can put atti in a room, and put his carrier in it so he hops in and I take him. I highly suggest that if you're uncomfortable with trimming your rabbits nails, you go to the vet or groomer. It may be semi-expensive, but it's better than being scratched and stressed out. I would not say to put a bunny on it's back unless you're 100% comfortable and the bunny's secured in a towel. They can easily kick out and break their backs. I have had my bunny for 10 months, handling him is a nightmare (my first bunny was a joy). could you please post some photos of the hold you have described here? I take him to vet right now for nail trims but it is stressful getting him in the carrier to go. It is better to turn the bunny upside down, lying on its back on your arm, and use the other hand to cut the nails. The bunnies goes into a "bunny-trance" in that position. It will not move for a while; and will not kick while you cut. This makes nail cutting a quick simple process. Do it while sitting on the floor, as the bunny may snap out of its trance anytime. do you trim the back nails too? What kind of clippers should you use to cut them though? Regular people toenail clippers? and how often do their nails need to be cut? Thanks a lot for the info....I was cutting my bunny's nails, one toe nail a week to avoid stressing her.....this method worked wonderfully...I just successfully did all toes with absolutely NO fuss at all.....Good stuff!!!! Thanks!! Does anyone know what to do if my bunny is absolutely terrified of being handled? Sometimes, she even runs away when I try to pet her (we don't keep her in a cage). Check the nails every couple of weeks. If you've noticed that they are getting long, trim them. I have had my bunny for 3 months and haven't clipped her nails yet, but they are getting pretty long. How often should I be trimming them? Kitten nail clippers work much better for this thab people nail clippers. Thanks for the info. Very comical and useful at the same time! Nothin better than that. I will trim and trim regularly.